After the greater Austin, Texas area reached a new record of 75 days with triple digit temperatures and no rain, something epic was bound to happen. 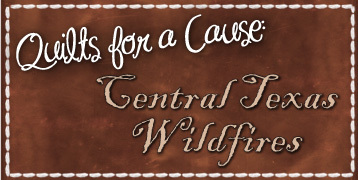 This past week several communities have had to evacuate their homes as over 180 wildfires have erupted. Over 1,000 homes have been destroyed presenting one of the most devastating wildfires in Texas history. As people have lost their homes and families have lost everything it is time to help out. We want every child who lost everything to have a cozy quilt to sleep under. One simple, but real thing to help families get back on their feet. Families have lost everything, let us start to rebuild their lives with a quilt. Heather from Modern Day Quilts is organizing this drive. She requests quilts to be at least 45” x 60”, although twin size bed quilts are encouraged. If you have questions, please email Heather at moderndayquilts@gmail.com. If you are in Austin, Heather will pick the quilt up, just send her an email at moderndayquilts@gmail.com. Please reblog, retweet, spread the word!